Think you can escape the mirrored corridors in the Castle of Savannah and rescue Princess Hannah from an endless maze of mirrors? Be on the lookout for tricky sections with infinite reflections! Which way will you turn? 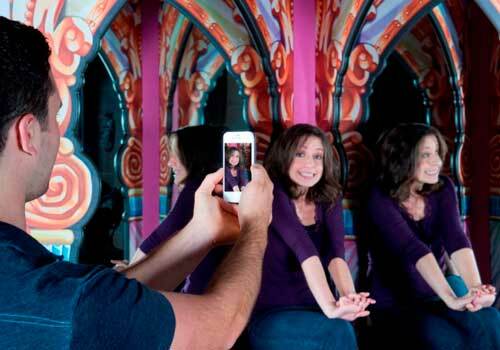 This interactive mirror maze is ideal for everyone in the family. Put your skills to the test in this top-rated attraction during your Branson vacation. Find out inside this modern-day fairy-tale where you’ll have the chance to summon your inner hero and rescue a princess from her fateful maze of mirrors. As the story goes, there once was a kingdom called Savannah with a reigning Princess called Hannah. Born lovely but consumed with loneliness as she grows, the Princess was cursed by Ugly Hetty for her vanity. Locked in a maze, her parents in a haze- now only you can save her! Team with King Oscar, Queen Emmy, and the Wizard of the Golden Globe to foil the curses of Ugly Hetty before time runs out. You’ll discover 288 potential turns among hundreds of mirrored walls and archways, and several sections where no matter which way you turn, you see infinite reflections in every direction. 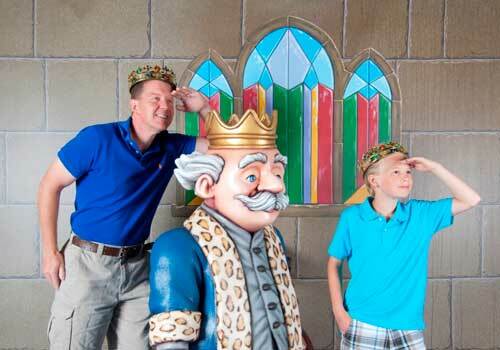 This adventurous quest is fun for all ages and makes a great family activity, where you’ll get lost and be sure to come out smiling! Combination Passes available with Hollywood Wax Museum and Castle of Chaos. Come Play With the Stars! Grab your camera and join your favorite stars for pictures that will make the best postcards from Branson! When you see the Great Ape of Branson on Highway 76, you’ll know you’re in the right place for A-list fun and A+ photo ops! You’ll rub elbows with the stars, pose for “selfies” and learn about their pets, pet peeves, charity work, and accomplishments. You'll find a mix of current celebrities, Academy Award winners, classic entertainers, and music superstars to delight every member of your family or group. See for yourself why so many Branson vacationers feel this is one of the best things to do in Branson! Buckle up and grab your 3D glasses for a non-stop shoot-em-up adventure that’s fun for all ages. It’s a thrilling 5D ride where you’re seated but feel like you’re moving through a whole new reality, as you compete for the highest score. Putt Your Way to Fame. Shoot through palm trees, parties, paparazzi, and Hollywood landmarks as you take the 18 steps to become a Hollywood star. Guided by your wisecracking agent, Marty McBooster, you'll go from Being Discovered to earning a star on Hollywood Boulevard. Fun is par for the course! (Requires separate admission ticket). 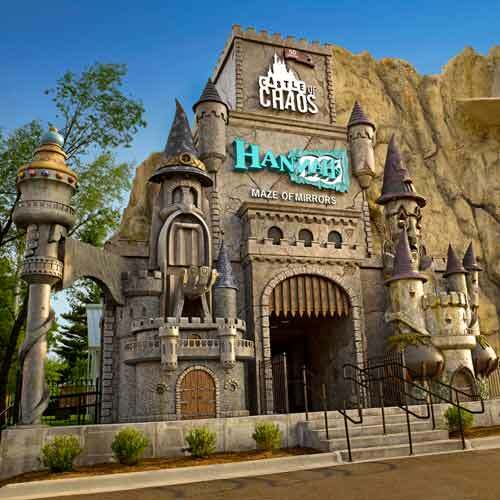 A separate admission ticket required for the Castle of Chaos, Hannah's Maze of Mirrors and Shoot for the Stars Mini Golf. Is there an age limit for this attraction? Guests of all ages can enjoy Hannah’s Maze of Mirrors. Where is the attraction located? 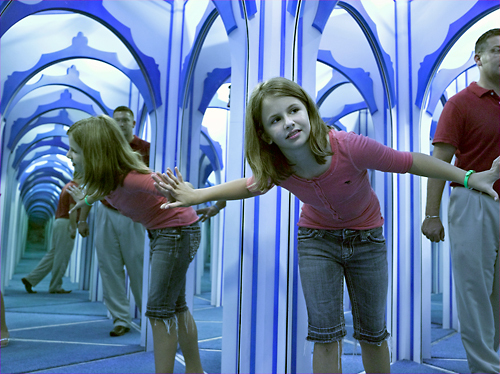 Hannah’s Maze of Mirrors is located in the Hollywood Wax Museum Entertainment Center at 3030 West 76 Country Blvd, Branson, MO 65616.